[reposted from 9-21-2010] We have had back to back to back holy days commemorating the appearance or disappearance of great saints in Gaudiya Vaishnavism. These include the appearance day of Shrila Jiva Gosvami (sort of hidden by Lord Vamanadeva’s appearance on the same day), the appearance of Bhaktivinoda Thakur, and today, the disappearance day of the “namacharya” (great teacher of the glories of the holy name) Shrila Haridas Thakur. Though I can’t do them justice especially in the same essay, at least in this short piece the significance of these great personalities can be brought to your attention, perhaps inspiring the need for more research. So please consider this three blogs in one! Though we don’t have to all be great scholars (as was Jiva Goswami), we do need to see life philosophically by being conversant with the basics of a Krishna consciousness outlook on life. Such a perspective will bring us peace and understanding in the current time of great turmoil, violence, suffering and confusion. Even without the difficulties in the larger world situation we all go through problems and reverses that can be seen in light of the Bhakti scriptures like the Gita, Shrimad Bhagavatam and others. This philosophy as been dubbed by Shrila Prabhupada as the “science” of Krishna consciousness, and we have no greater teacher or philosopher than Shrila Jiva Goswami. One of his great contributions is that he wanted a very safe and prominent place to store all the Goswamis' literature. So he built a library and there all the writings of Rupa, Sanatana, Raghunath das, Gopal Bhatta, and Krishnadas Kavira Gosvamis, were kept safely. Jiva Goswami's library was in the Radha Damodara temple. His major contribution was his own philosophical writings. It has been approximated that he has written more than 400,000 Sanskrit shiokas and over 25 beautiful books like the Satsandarbha, Gopal Champu and others. Under the instruction of Rupa and Sanatana, Jiva Goswami took the principles of Chaitanya Mahaprabhu's philosophy and like no one had ever done before, he established those principles on the basis of sound philosophy and such strong evidences from authorized Vedic scriptures that he was actually the one that really established the philosophic basis for this movement. This is why we would claim that Shrila Jiva Goswami is the greatest philosopher, and that he demonstrated how our Gaudiya Vaishnava philosophy is the most unique and complete in the world of religious and spiritual thought and practice! Shrila Bhaktivinoda Thakur was called by a secular newspaper writer during his lifetime, “the Seventh Goswami” after the six principle Goswami disciples of Lord Chaitanya who were responsible for creating the philosophical framework of Gaudiya Vaishnavism and developing the holy place of Krishna’s pastimes in Vrindavana. Bhaktivinoda did a very similar thing during his life. World religious scholars should study his life as a significant religious reformer and revivalist of the late 19th century. 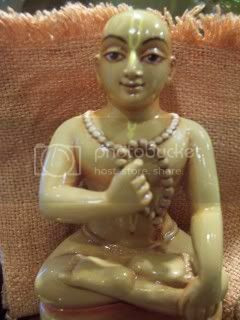 There are many Vaishnava lineages which are traced back to the associates of Lord Chaitanya. Although not all bona-fide due to the lack of truly advanced descendants, it was the tradition during the life of Bhaktivinoda Thakur and his son—our gurus’ guru, Shrila Bhaktisiddhanta Sarasvati Thakur—that someone would ask you which eternal associate, or “parivara”(family) your lineage was coming from. Shrla Bhaktisiddhanta Sarasvati Thakur would reply, “Bhaktivinode Parivara” or the line coming from the liberated soul, Bhakitvinoda Thakur. This was Sarasvati Thakurs realization, and not due to his biological relationship to his father. And Prabhupada considered his movement, or ISKCON, the movement of Bhaktivinode Thakur. Bhaktivinoda was a pioneer in so many ways. For example, he was the first Gaudiya Vaishnava to converse with the Western intelligentsia. He thought deeply on how to interface with modern times, taking into consideration the cultural current and biases in order to make Krishna conscious accessible. His insights have fueled the adaptability of bhakti in varied cultures of the world, by distinguishing form/externals from substance/goal, or rituals and spiritual essence. We in turn have to understand this in order to keep Krishna consciousness vital and not stagnant, as so often happens to religions which institutionalize the founder. 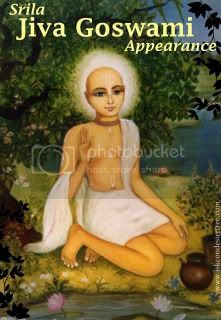 In short, Bhaktivinoda Thakur is responsible for reestablishing Shri Chaitanya Mahaprabhu's sankirtan movement which had become almost extinct by the mid 19th century. Due to sahajiya influence (false sentimental sects that lack scriptural understanding), the mission had deteriorated greatly, and later, by the policy of the British, it was further perverted. Through his tireless efforts, however, the Thakur restored the purity, prestige and respect of the Vaishnava creed amongst the cultured gentlemen of his day. He foresaw the worldwide spread of Krishna consciousness, and laid the seeds for that future propagation as above mentioned. Today's devotees of Krishna are the testimony to this! His books are essential reading for furthering our understanding of Krishna conscious as confirmed in many places in Shrila Prabhupada’s books. It is recommended that we have a firm foundation in Prabhupada’s writings. Then we won’t be confused but will find great inspiration in Thakur Bhaktivinoda’s writings, noting his slightly different, though philosophically consistent explanations. We must remember that preaching is according to the time, place and circumstances that devotees find themselves in. Our Prabhupada didn’t appear in a vacuum, but in a line of disciplic succession. We have one “siddhanta” or conclusion of the Krishna conscious philosophy, but different religious expressions due to the spiritual feelings of the great teachers. 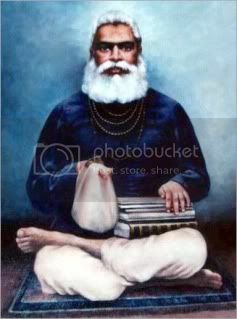 Bhaktivinoda left us innumerable songs and books to help us in our spiritual advancement. Relative to our discussion, he gave us the “Harinama Cintamani” which is a book complied from the teachings of Haridas Thakur. Here is a short sketch of his life from the introduction of that book. I hope you will find out more about our great teacher of the holy name, or Namacharya. 5. 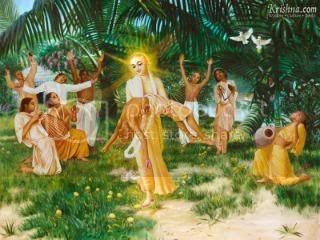 One day, after bathing in the sea, Lord Caitanya met Haridasa Thakura under a siddha-bakula tree. Happy at heart, He earnestly asked, "How may the conditioned souls be easily delivered?" 6. Weeping and weeping, and the hairs of his body erect, and humbly grasping the Lord's feet, saintly Haridasa said, [Master, Your pastimes are very deep. 7. "I am very poor. I have no wealth of knowledge. Your feet are my only wealth. O master, what good result will You gain by suddenly asking this question of such an unfit person? 8. "You are the Supreme Lord Krsna. To deliver the conditioned souls You have descended to Navadvipa. Please be merciful. Please be kind. O Lord Gaura, please protect me. Please make my heart blossom with happiness. 9. "Your names have no end. Your transcendental qualities have no end. Your form is an ocean of bliss. Your pastimes have no end. Please be merciful and allow this sinner to relish the sweetness in them. 10. "You are the spiritual sun. I am a single ray of Your sunlight. You are the master. I am Your eternal servant. The nectar of Your feet is my wealth of pleasure. My desires rest on the nectar of Your holy names. 11. "O master, I am fallen. How will I know what to say? Still, I must obey Your command. The words You place in my mouth I will happily speak. i will not try to judge their virtues or faults. 12. "Lord Krsna is the one Supreme Personality of Godhead. There is no other. His every desire is always fulfilled. He is eternal. He is the master of all potencies. He is greater than the greatest. 77. "O Supreme Lord, thinking how to benefit the conditioned souls, in Kali-yuga You descended to this world with the holy name. 78. "You taught that nama-sankirtana (chanting of the holy name) is the yuga-dharma (religion of the age). By following this direct path of chanting the holy name, the conditioned souls attain a great treasure of love for Lord Krsna. 79. "Simply by chanting or remembering the holy name the conditioned souls will become delivered. 80. "In chanting the holy name the goal and the way to attain it are not different. 81. "In this path there are no obstacles in the way to attain the goal. O Lord, by Your mercy the conditioned souls easily attain the goal. 82. "I am fallen. I am plunged in an ocean of material sense objects. O Lord, I am such a fool that I did not worship Your holy name." 83. Sighing and tears streaming from his eyes, Brahma-Haridasa fell before Lord Chaitanya's feet.